WASHINGTON (Sputnik) - US President Donald Trump said in a joint press briefing with German Chancellor Angela Merkel on Friday that he would not comment on using military force in Iran. "I don’t talk about whether or not I’d use military force. It’s not appropriate to be talking about," Trump said. However, Trump added that Iran will not be "doing nuclear weapons" and that "you can bank on that." The Iran nuclear agreement — formally known as the Joint Comprehensive Plan of Action (JCPOA) — is not sufficient enough to deter Tehran’s destabilizing activities in the Middle East, German Chancellor Angela Merkel said during the joint press conference. "We have the opinion that the JCPOA is a first step that has contributed to slowing down their activities in this particular respect to also establishing a better monitoring process, but we also think from a turning point perspective that this is not sufficient in order to see to it that Iran’s ambitions are curbed, contained," Merkel said. The German chancellor pointed out it is most important to acknowledge that Iran is trying to exert a geopolitical influence in Syria, Lebanon and Iraq. In addition, Europe and the United States should work closely to bring a solution to the situation in Syria, Merkel said. 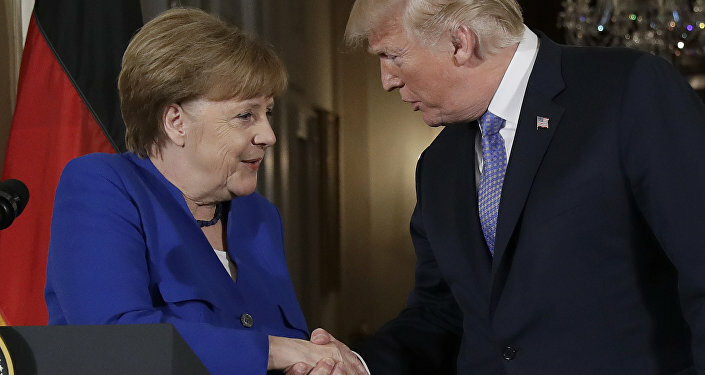 Trump and Merkel discussed Iran and the 2015 Iran nuclear agreement, also known as the Joint Comprehensive Plan of Action (JCPOA), during their meetings. Trump has repeatedly criticized the nuclear agreement, which limited Iran’s nuclear research in return for sanctions relief, and has threatened to withdraw the United States from the deal if it is not modified. In January, Trump asked Congress to address "flaws" in the agreement. The United States is expected to announce whether it will extend sanctions waivers for Iran on May 12.